I’ve been posting a lot of old UPI news stories, so let’s change the pace a bit. This story was written for my wife’s real estate blog, pinellasnewsboy.com . 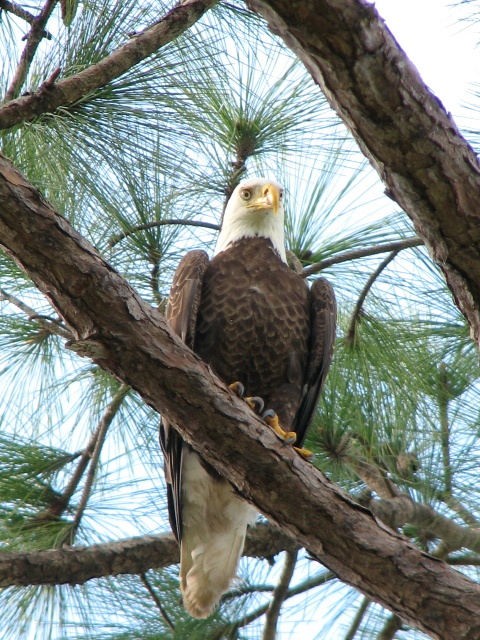 Stories and pictures on this blog are meant to describe what it’s like to live in Dunedin, FL, and that involves stories about unusual discoveries and people — yep, not unlike the old “people” stories written for United Press International or for the newspapers I worked for. In this case, I used to walk my dog along a golf course in Dunedin. 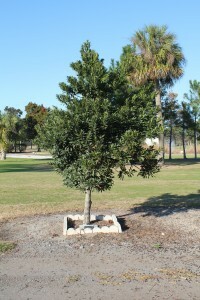 One day, I noticed a small tree with a granite plaque at its base. The inscription led me to do a little internet research, and this story resulted. As I always do with her blog, I write the stories under her name. There are two golf courses in Dunedin, and we live in a condo right between them. Step out our front door and walk to the left, and in a minute or so you are in front of Dunedin Country Club. Walk to the right, and in about the same amount of time you are walking past a par-three public course, Dunedin Stirling Links. I usually walk east, in the Dunedin Country Club direction, when I walk Bo, our puggle. My husband usually goes in the other direction, and heads past Dunedin Stirling Links when it is his turn to walk the dog. Down in that westerly direction, not quite as far as Alt. 19, there is a small tree. Its trunk is surrounded by white decorative blocks. We both have walked by that tree many times, but it was only recently that we noticed there was a small plaque in the ground at the tree’s base. As you travel around North Pinellas County, there are quite a few commemorative plaques, but you have to pay attention or they simply blend into the background and you never see them. All of them have been put in place for a reason, but they don’t always have room to tell the entire story. Someone went to some trouble to plant that tree in a young man’s memory, and I thought I’d see if I could find out more of the story. It didn’t take much work. I went to the St. Petersburg TIMES website (okay, I know, its been called the Tampa Bay TIMES since New Year’s Day, but I don’t think I’ll ever get used to calling it that), and found a story published just before Christmas of 2005. 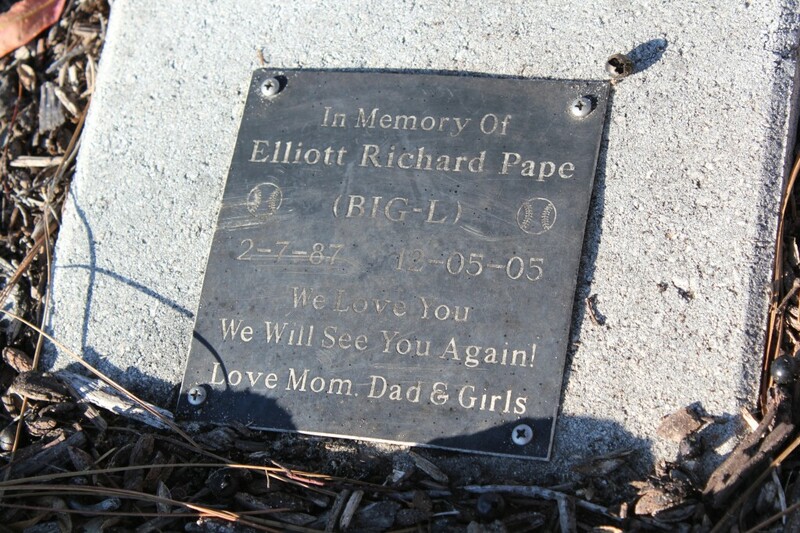 Elliott Richard Pape was an 18-year-old Dunedin youth who worked part-time as a bat boy for the Tampa Bay Rays baseball team. On Dec. 12, 2005, he was killed in a motorcycle accident as he rode home. “On Monday afternoon, Pape was riding his 2006 Suzuki motorcycle home to Dunedin. He took the Roosevelt Boulevard exit ramp off Interstate 275 at 4:08 p.m. when he lost control in the turn, the Florida Highway Patrol said. So that’s the story of the tree. I don’t know whether Elliott Richard Pape liked to play golf at Dunedin Stirling Links, but hopefully his tree will grow and prosper, and golfers will stop there once in a while to read the plaque that his family put there.